The oldest traces of the contemporary town’s territory settlement are stretching back to the Neolithic Age (6000 – 2900 B.C.). Founds of three bronze jewels lead to a presumption that there were bronze object workshops in Rimavská Sobota in the middle and late Bronze Age (15th – 7th cent. B.C.). Another archaeological monuments bear evidence of human existence in the early Iron Age (7th – 3rd cent. B.C.). During the period of the Migration of the Nations (5th – 6th cent. ), after Celts (3rd – 1st cent. B.C.) and Germans (1st – 4th cent. ), several groups of various ethnic origin passed this way. Finally, the Slavs settled down here forever. It could be supposed from several indications that mostly Slavic (Slovak) agricultural inhabitants settled down in the area of Rimavská Sobota in 7th – 8th century. 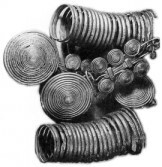 For example, sigmoid ear-rings from the period of Greater Moravia (9th cent.) or Slovak motives of local habitations' names “preserved” in their Hungarian variants (Mučín, Trnovec, Gač, Techan and others) bear an evidence of the following development of this settlement. Since the beginning of 10th century, the military groups of Old Hungarian tribes from middle Poiplie were coming to this area. However, the Hungarian shepherds – stock-breeders began to settle since middle of 11th century and they also changed their life-way to agricultural. Medieval Rimavská Sobota was founded probably in 2nd half of 11th century around the market square beside the Church of St. John the Baptist, where regular fairs were held. This location had already before the function of religious and commercial centre for habitations Mučín, Trnovec, Gač, Techan, Sobôtka, Rimava (today Tomašová) a Kurinec, which lay beside it. Later (in 11th and 14th cent.) many inhabitants left these habitations a came to Rimavská Sobota because they believed that there were better material and spiritual conditions for their personal as well as proprietary safety. The oldest written mention about Rimavská Sobota known as “Rymoa Zumbota” is from the year 1271 and it reflects its sub-regional market importance. The first liege of Rimavská Sobota, supported by documents, was an archbishop from Kaloča. In the 13th century, it also became a residence of so-called “hradský špán” (“comes curialis”), who governed not only Rimavská Sobota but also another archbishop’s properties at the middle and superior Rimava river-basin, a separate economic and administrative unit, so-called "Rimavské španstvo” (“Comitatus de Rymua”). In 1334, Tomáš Sečéni (a duke from Transylvania and district administrator from Solnok) became a new owner of Rimavská Sobota. He obtained it together with other surrounding villages from archbishop of Kaloča in exchange for his properties in Báčska and Sriemska siege. On the basis of duke Tomáš request, the King Charles Robert issued a privilege charter in 1335 in Rimavská Sobota, by which he conferred a municipal law of Budatín to it. In 1387, the King Sigmund of Luxembourg visited Rimavská Sobota. On this occasion, he gave it a blazon consisting of silver shield and black eagle with red armour (beak, tongue, clutches). From blazon colours also the black-red-white flag of town is derived. Since the beginning of the 15th century, Rimavská Sobota was growing as a feudal town - a small town (“oppidum”) in terms of legal categorization of towns. In years 1447, 1451, and 1452 it was a setting for peace discussions between Ján Jiskra, representing claims of infant King Ladislav V. and Ján Huňady, a governor of the Ugrian kingdom. However, in the first half of 15th century, there was a significant economic development, first guilds were established – furrier, fuller and butcher. In 1460 Ladislav II., last male descendant from the Sečéni family died and due to his daughters Rimavská Sobota got as a heritage into the property of Lošonciovci and Orságovci from Gut. In the following decades, other guilds grew in town. Remarkable guild is an associated guild of goldsmiths, blacksmiths, saddlers, girdlers, locksmiths, grinders and coopers, established in 1479 as a so-called altar brotherhood of St. Michal Archangel. In 1506, there was a devastating fire in Rimavská Sobota, biggest in its history. In order to recover from fire consequences, the King Vladislav II. exempted town from taxes and duties for eight years. Later, he approved its privileges received from his predecessors in the past. The inhabitants of Rimavská Sobota appreciated mainly an exemption from any turnpike tolls, custom duties and other road fees in the whole territory of the Ugrian kingdom in 1512. Within following renovation, the square of Rimavská Sobota was formed into a quadrangular shape and a regular system of adjacent streets was added to it that was preserved in the centre until the 20th century. A promising development of Rimavská Sobota was marred by Turkish invasion who settled it down in 1553. From 1555 to 1593, they governed it from near water-fortress Sobôtka, where they also set up a county seat – a so-called “rimavskosobotská náhija”. The second period of Turkish occupation of town began in 1596 and it lasted by the year 1686. From this period, a unique collection of 256 Turkish documents and letters associated with town’s tributary obligations has been preserved. Taxable ports expressively showed the evidence of negative consequences of the Turkish master-ship as it had decreased from 127 in 1542 to 12 in 1648. In terms of Ugrian feudal law, Forgáčovci a Séčiovci obtained Rimavská Sobota at the end of the 16th century. In that period and later until the half of the 19th century, Rimavská Sobota has been referred to as a privileged town or small town (“oppidum privilegiatum”) in the Latin written documents. In the 17th century, several expeditions of anti-Habsbourg rebels went through Rimavská Sobota. The armies of Gabriel Betlen (1626) and Juraj Rákoci (1645) camped in its land area. From the economic point of view, the fairs which were organized eight times within a year had very important role. Since 80s of the 17th century, the importance of Rimavská Sobota as a political and later also administrative centre of the Malohont district increased. Certain decrease was caused by consequences of František II. Rákoci’s uprising defeat (1711). However, after long period, the 18th century was a period of economic and social prime for Rimavská Sobota. The King Charles III. affirmed a right to dram-shop (1725), a right of the sword (1735) and other privileges to Rimavská Sobota in the form of privilege. The prominent place in its life belongs to the craft guilds. In addition of above mentioned producers, also the tanners, potters, so-called “čutoráši” rare in Slovakia, weavers, boot-makers, shoe-makers, tailors and others set up their guilds. The beginnings of these guilds, similarly as in the case of local merchant guild, were stretching back to the previous century. In 1747, Rimavská Sobota bought out itself from servile dependency on Forgáč family and in the 90s of the 18th century also from the dependency on members of Koháry family, who in that time owned feudal rights after Séči family. Since that period, Rimavská Sobota was marked as a free privileged town. In 1769, the Calvinists from Rimavská Sobota attacked the Catholic procession, because they thought the Calvinists wanted to capture their church. The Queen Maria Theresa gave a command to dismount it for punishment in 1771 and to build a new catholic church instead of it. In the period of Josephine reform of public administration, Rimavská Sobota became a residence of the first Gemer - Malohont siege (1786 – 1790). In 1805, during returning from Battle of Slavkov, the Russian General M. Kutuzov with his soldiers stayed in Rimavská Sobota overnight. In 1831, the town was attained with cholera that caused a great loss of 231 dead. During the Revolution in 1848, Rimavská Sobota outfitted 220 soldiers and 28 members of the National Guard for Ugrian government. In February 1849, the Austrian imperial army with General F. Schlik camped in Rimavská Sobota for several days. In August, the Slovak volunteers under command of the Colonel H. Lewartowský acted here. After beginning of the Bach’s absolutism, Rimavská Sobota became a feudal centre of the Gemer-Malohont or Gemer siege (1850 – 1860) for the second time. For the third time it gained a function of an administrative residence of Gemer-Malohont in 1883 and it acted under this function until the end of district establishment in 1922. At the early beginning of the 20th century, a canning factory (1902) was founded in Rimavská Sobota that predetermined a subsequent development of the local food industry. In May and October 1918, natural uprisings of local crew began. After formation of Czechoslovak Republic, a battalion of the 32nd regiment of the Czechoslovak Italian legionaries occupied Rimavská Sobota in January 1919. However, already at the end of May, the Hungarian Red Army came to the town and consequently a town directory was established. Since 5th July 1919, the town was again under the control of Czechoslovak state. The change of this status occurred from November 1938 to December 1944, when Rimavská Sobota was occupied by Hungary of Horthy in consequence of Vienna Arbitration. Rimavská Sobota was liberated on the 21st December 1944 by armies of the 240th gunnery division of the 2nd Ukrainian front. After liberation, mainly in the second half of the 20th century, a sharp economic, residential and social life growth occurred in Rimavská Sobota. The number of the population increased from 9 160 in 1948 to 25 507 in 1998. Many new manufacturing corporations were found – creamery (1948), tobacco factory (1957), sugar factory (1966), brewery (1967), plant for meat processing (1977), mill and bakery (1980) and others. After 1989, some of them declined, some of them, for example Tauris, a joint-stock company for meat processing, have been still dynamically developing.